2. Add the onion, potato, carrots and garlic. 3. Cover the pan with a lid and simmer until tender. 4. Add the curry powder, tomato puree, milk and orange juice. 6. Heat butter in a small frying pan. 7. Stir-fry the spring onions for a minute. 8. Add the soup and simmer for a few minutes until heated through. 9. Transfer to individual serving bowls. 10. Serve hot with soup sticks. 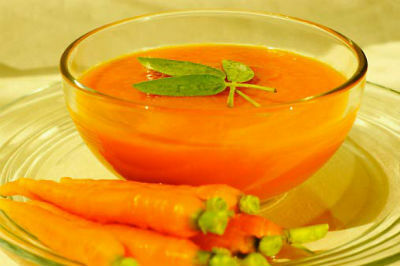 Feel free to comment or share your thoughts on this Curried Carrot Soup Recipe from Awesome Cuisine.